The U.S. Navy guided-missile destroyer USS Curtis Wilbur patrols in the Philippine Sea in this August 15, 2013 file photo. The destroyer sailed within 12 nautical miles of an island claimed by China and two other states in the South China Sea on January 30, 2016 to counter efforts to limit freedom of navigation, the Pentagon said. (by Gordon Lubold in Washington and Jeremy Page in Beijing, The Wall Street Journal) — A U.S. warship conducted a patrol Saturday around an island in the South China Sea claimed by China and two of its neighbors, another in a series of operations challenging Beijing’s recent efforts to enforce maritime and territorial claims in the region. 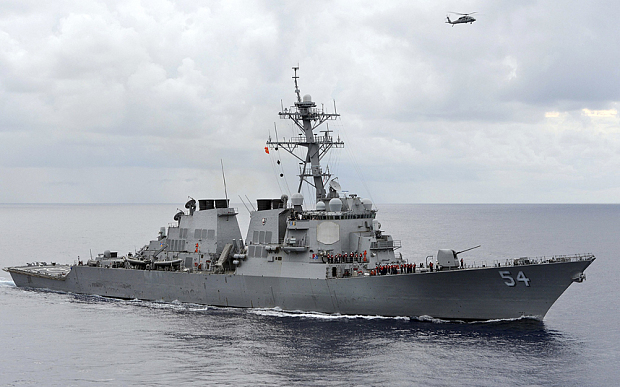 The USS Curtis Wilbur, a destroyer, navigated within 12 nautical miles of Triton Island in the Paracel island chain in the South China Sea, a senior U.S. defense official confirmed. Triton Island is a manned Chinese outpost but is also claimed by Taiwan and Vietnam. Known as a “freedom of navigation operation,” the patrol represented a challenge not to any territorial claim over Triton, but to what the U.S. sees as excessive restrictions from all three claimants on the waters surrounding the island, U.S. officials said. It was the first such U.S. operation around the Paracels since 2011, they said. China says it has “indisputable sovereignty” over all South China Sea islands and their surrounding waters. It has controlled all the Paracels since seizing them from Vietnam in 1974. The warship traveled within 12 nautical miles of Triton without providing prior notification to any of the three claimants, the U.S. defense official said. That is legally significant because it shows the U.S. exercising its rights to navigation over demands from all three claimants that foreign warships seek permission or give prior notice to transit their territorial seas. China’s foreign ministry and defense ministry both issued statements saying the U.S. vessel had violated a Chinese law requiring foreign warships to seek approval from Beijing to enter its territorial waters. Senior Col. Yang Yujun, a defense ministry spokesman, said Chinese naval forces and troops guarding the island had identified the U.S. ship and warned it to leave the area immediately, according to a statement on the ministry’s website. The operation lasted about three hours, the U.S. defense official said, declining to provide more specifics. The defense official also declined to describe any communications or interactions with the Chinese or vessels from other nations. But there was no Chinese navy presence seen in the area, the official said. Patrols in the past have garnered significant attention from the Chinese, who typically send a small flotilla to investigate the arrival of any foreign nation’s ships. “We saw nothing that was unusual in terms of the reaction,” the official said, declining to elaborate further. The U.S. has watched with increasing alarm as China has stepped up activities to enforce claims to islands and other land masses in the South China Sea, including among the Spratly and Paracel island chains. 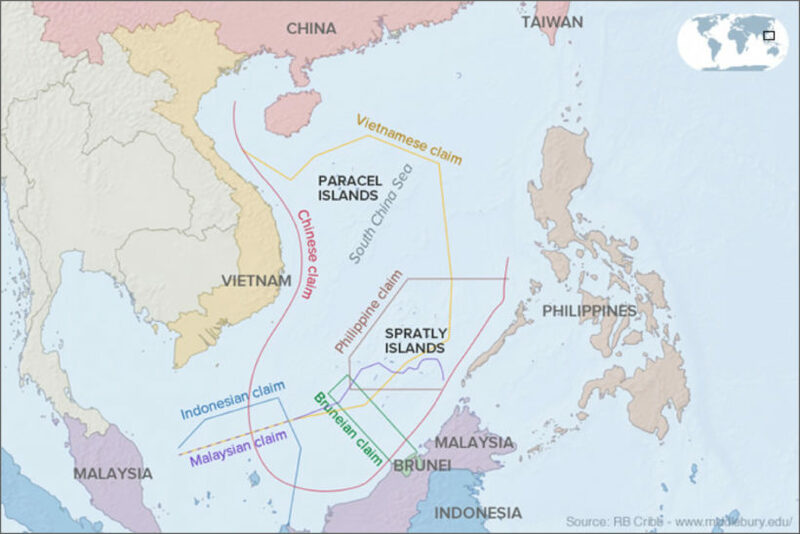 Beijing’s claims in the Spratlys are contested by Vietnam, Malaysia, Taiwan, Brunei and the Philippines—a U.S. treaty ally. In the last two years, China has built seven artificial islands on the rocks and reefs that it controls in the Spratlys, raising fears among other claimants, and in the U.S., that Beijing will use them to enforce its claims in the area. China has pledged not to “militarize” the islands, but hasn’t made clear what that means. Beijing lodged a formal protest over that and said its navy ships tracked the U.S. vessel, warning it to leave. The U.S. says it doesn’t take a position on who has sovereignty over land features in the South China Sea, but is opposed to the restrictions imposed by any country on navigation rights and freedoms around a feature such as Triton. “The excessive claims regarding Triton Island are inconsistent with international law as reflected in the Law of the Sea Convention,” according to a statement. U.S. officials said Saturday’s exercise was conducted on the basis of “innocent passage”— which according to the United Nations Convention on the Law of the Sea allows naval ships to transit another nation’s territorial waters without prior notice if they don’t conduct threatening activity. China and some other nations have long demanded that foreign military vessels request permission before entering their territorial waters. In September, however, a flotilla of five Chinese warships came within 12 nautical miles of the Aleutian Islands in the Bering Sea, a rare foray into U.S. territorial waters that was also done without prior notice and as “innocent passage”. Copyright 2016 Dow Jones & Company, Inc. All Rights Reserved. Reprinted here for educational purposes only. May not be reproduced on other websites without permission from The Wall Street Journal. Visit the website at wsj .com. 2. Why did the commander of the USS Curtis Wilbur take this action? (What was the motive of the U.S.?) Be specific. 3. The U.S. destroyer traveled within 12 nautical miles of Triton without providing prior notification to any of the three claimants, a U.S. defense official said. What is the significance of this action? 4. How did the Chinese react to this U.S. patrol? 5. How did the U.S. respond to the Chinese claim that it warned the U.S. ship to leave the area immediately? 6. What concern does the U.S. (and claimants Taiwan and Vietnam) have over China’s build up on the rocks and reefs that it controls in the Spratlys? 7. What was the purpose of a similar patrol by a U.S. Navy destroyer in October? 8. What action by the Chinese in September illustrates the government’s hypocrisy? Passage is innocent so long as it is not prejudicial to the peace, good order or security of the coastal State. Such passage shall take place in conformity with this Convention and with other rules of international law. The UN Law of the Sea treaty is the international agreement. The Law of the Sea Convention defines the rights and responsibilities of nations with respect to their use of the world’s oceans, establishing guidelines for businesses, the environment, and the management of marine natural resources. The Convention, concluded in 1982, replaced four 1958 treaties. As of January 2015, 166 countries and the European Union have joined in the Convention. China and the U.S. have signed onto the Law of the Sea Convention. Until the early 1900s, all waters beyond national boundaries were considered international waters: free to all nations, but belonging to none of them. In the early 20th century, some nations expressed their desire to extend national claims: to include mineral resources, to protect fish stocks, and to provide the means to enforce pollution controls. Using the customary international law principle of a nation’s right to protect its natural resources, President Truman in 1945 extended United States control to all the natural resources of its continental shelf. Other nations were quick to follow suit. Between 1946 and 1950, Chile, Peru, and Ecuador extended their rights to a distance of 200 nautical miles to cover their Humboldt Current fishing grounds. Other nations extended their territorial seas to 12 nautical miles. By 1967, only 25 nations still used the old 3-mile limit, while 66 nations had set a 12-nautical-mile territorial limit and eight had set a 200-nautical-mile limit. As of May 2008, only two countries still use the 3-mile limit: Jordan and Palau. Read an additional news report on this story at csmonitor.